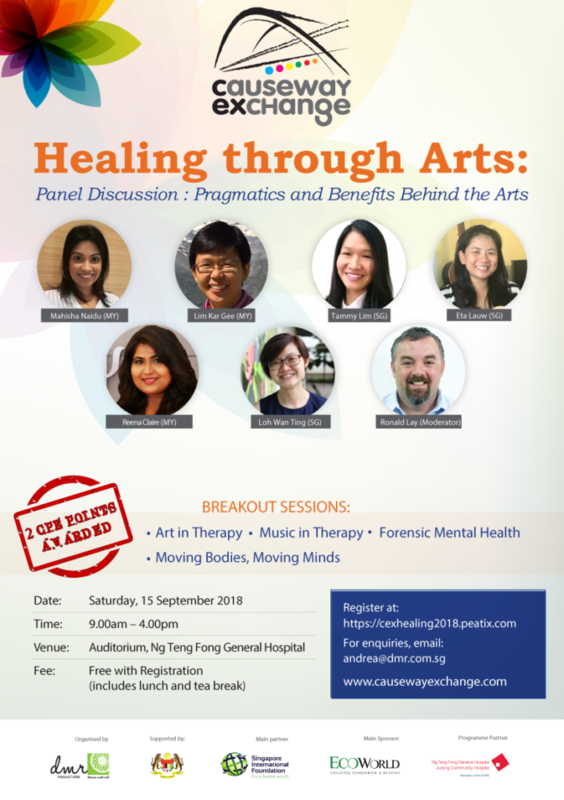 Addressing the growing field of the Arts Therapies (Art Therapy, Music Therapy, Dance/Movement Therapy and Drama Therapy) in the medical/health industry, panelists will discuss the pragmatics and benefits of these practices as well as the effects in using the arts for emotional and psychological healing. The creative arts therapies work effectively together and can be integrated within multidisciplinary and collaborative environments.Many different strategies and approaches have been identified over the years and it is now recognized almost universally that artistic and creative self-expression such as painting, dance, literature, music, and theatre to name a few can begin and facilitate the healing process when other avenues have seemingly failed or have not worked. This conference brings Artists and Therapists together to share their experiences and viewpoints on the healing benefits and potential of the Creative Arts. ** Please kindly register for your break out session as well. Forensic mental health plays a critical role in the rehabilitation process of people within a range of legal systems. Providing art therapy within these contexts can significantly improve creative self-expression, develop and reinforce key social skill sets, establish meaningful leisure skills, talents, and interests, and enhance one’s overall quality of life. This presentation will explore these topics in relation to clinical case material and will be augmented through a hands-on art activity. This one-hour session will allow participants to have a glimpse into Dance Movement Therapy as a therapeutic intervention; providing attendees with a better understanding of the power of the mind-body connection. It will offer participants a space to express, explore, discover and connect through dance and movement, in a safe and boundaried space, in the presence of a licensed Dance Movement Psychotherapist. This session consists of some music therapy activities that allow the participants to be introduced to what music therapy is. It will also provide an opportunity for the participants to connect with music, both actively and passively, aiming to experience how music therapy is beneficial, especially in clinical work. It is often mentioned that art can be a safe platform for self-expression and a way to understand ourselves better. But what exactly is art therapy and how does it works? This session will provide participants with an introductory talk and a hands-on art activity to gain a better understanding of Art Therapy. Ronald PMH Lay has extensive mental health and service provision experience spanning over 25 years in three distinct countries: Canada, United States of America, and Singapore. He also has professional memberships with the Australian and New Zealand Arts Therapy Association, Art Therapy Credentials Board, the American Art Therapy Association, and the Art Therapists’ Association Singapore. For 12 years, Ronald provided art therapy to adults residing within a large forensic mental health facility in Northern California. The California State Legislature awarded him the Sustained Superior Accomplishment Award, a two-year honour, on two separate occasions.Ronald is the programme Leader of the MA Art Therapy Programme at LASALLE College of the Arts in Singapore. He also provides workshops and presentations internationally on several topics such as art therapy, forensic mental health and the development of art therapy in Asia. Ronald is currently pursuing a Doctorate in Education at The University of Western Australia. Wan Ting is an Art Therapist at Creative MINDSET Hub at the Singapore Association for Mental Health (SAMH), working with both adults and children providing individual and group art therapy interventions for three years. From daily art-making sessions, individual art therapy to group therapy sessions, she works with various groups of individuals ranging from clients with mental health issues to members of the public of varying age groups from children to adults. Using art-making to foster interactive experiences, eliciting reflection and insights from her clients, Wan Ting works to improve the psychosocial well-being of the latter. She also facilitates art experiential workshops to empower clients and members of the public to unleash their creativity and express emotions. Tammy graduated from Texas Woman’s University with a Masters in Art (Music Therapy). She also holds a Bachelor of Psychology from the University of North Texas. She is currently developing the music therapy program at Assisi Hospice in Singapore. Tammy’s work has been featured by Temasek Review 2017, the Straits Times, Lianhe Wanbao, and Feng Cai Magazine in Malaysia. Tammy’s professional practice includes hospice/palliative care, children and adult bereavement, dementia, geriatric care, and mental health settings, both in Singapore and the United States. She has presented in several international and local conferences and trainings, including the World Congress of Music Therapy, Asia Pacific Palliative Care Conference, and Malaysia Music Therapy Conference. Tammy’s research interests lie primarily in the pain management, loss and grief issues, and late stage dementia. She is currently receiving the Bonny Method Guided Imagery and Music training under the supervision of Dr. Nicki Cohen from Texas, USA. Eta Lauw is a Registered Music Therapist with a Masters of Music Therapy from the University of Melbourne. Eta’s work in Singapore ranges from working with school-going children with multiple disabilities to older adults with dementia in an acute and community hospital. Eta has also piloted a group music therapy programme for stroke survivors in the community. Eta enjoys working with different clinical populations across different age groups and is particularly interested in using musical experiences to foster personal development and to encourage community integration and bonding. As a clinician who strongly believes in culturally-centered practice, Eta has also published articles relating to the impact of culture in music therapy work in peer-reviewed journals. Eta is a Professional Member of the Australian Music Therapy Association and the Association for Music Therapy, Singapore. Prior to her journey to become a music therapist, Eta worked for 10 years in the media and communications industry. Lim Kar Gee is one of the pioneers in the music therapy profession in Malaysia with over 15 years of experience and is registered with the Certification Board of Music Therapists, United States of America (USA). She holds a Master of Arts in music therapy from St. Mary-of-the-Woods College, Indiana and a Bachelor of Arts in music therapy from University of Miami, Florida. She also obtained training in Music and Imagery from Anna Maria College, USA. Kar Gee has worked with children with cancer and with special needs and has lectured part-time in prominent universities in Malaysia. She previously worked as a music therapy practicum supervisor and a guest lecturer in Central Conservatory of Music in Beijing, China. Currently, Kar Gee works mainly with adults who face psychological and emotional challenges. She also lectures at Taylor’s University in Kuala Lumpur. Reena Clare is a qualified Art Psychotherapist (MA) based in The Mind Faculty, Mont Kiara and with AnagsanaCare to provide art therapy to pediatric palliative clients. Art Psychotherapy is a psychological therapy that she uses to help clients address complex and confusing emotions, foster self-awareness, work through trauma, challenging behaviours and mental health conditions through art. She has worked with various clients including those living with mental health diagnosis, special needs, bereavement, dementia, addictions and physical health conditions with the NHS, Kids Co, and Wesminister Arts. She is also a certified Practitioner in Children’s Accelerated Trauma Treatment (CATT), Mentalization-based Art Therapy, Mindfulness and Art Therapy, and Schema Therapy. Mahisha Naidu is a UK Registered professional practicing Dance Movement Psychotherapist. She obtained her MA from Goldsmiths College, University of London, where she had the opportunity of working with various populations, including children with learning, social and behavioral difficulties, as well as adults struggling with mental health illnesses, such as schizophrenia. Currently, she sees clients as the consultant Dance Movement Psychotherapist at Valley Psychological Services and Inpsych Psychological and Counseling Services, both, mental health centres located in KL, Malaysia. Additionally, she also lectures for the Upper Iowa University Psychology program, based at of SEGi College, KL. As a dancer, fitness instructor and DMP practitioner, she vouches greatly for the power of movement in enhancing one’s self-expression through creative exploration and the development of the mind-body connection. She wishes for all to be given the opportunity to continue making discoveries and better their self-understanding, when words may simply not be enough.